Original 1976, first release, linen-backed U. 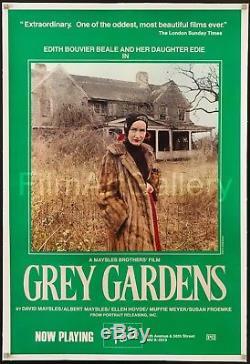 1 Sheet poster for the cult classic'Grey Gardens', starring the Beales: "Big Edie" and "Little Edie", relatives of Jackie Onassis who lived in a run-down Long Island mansion. This documentary, which was directed by Albert and David Maysles, has a huge following - especially amongst gays - and has spawned books, a Broadway musical and an HBO movie. This poster dates from the premiere engagement of the film in New York City and has the theater info (the famous "Paris Theater", next to the Plaza Hotel) printed at the bottom. Poster measures approximately 27" x 41" inches (linen border extends about 3/4 all around) and condition is very fine: originally folded, it has been beautifully linen-backed and is ready to frame! Please note that the magnets in the borders are used during the photographic process and are not pushpins or elements of the design. PLEASE SEE OUR OTHER AUCTIONS AND STORE ITEMS FOR COOL MOVIE POSTERS. It must come back in the same condition as it was sent. FILM/ART has one of the finest collections of original movie posters. The item "GREY GARDENS 1976 original U. 1 sheet linen-backed Edie Beale Film/Art Gallery" is in sale since Friday, July 13, 2018. This item is in the category "Entertainment Memorabilia\Movie Memorabilia\Posters\Originals-United States\1970-79". The seller is "filmartgallery" and is located in Los Angeles, California. This item can be shipped worldwide.